This week’s message came to me through my friend, Karen Davis, who has been serving alongside her husband, Don, in Haiti since 1980 under the auspices of World Outreach Ministries. The message was written by the founder of World Outreach, Jason Peebles. Karen, who works with Missionary Flights International at the airport in Cap Haitian, Haiti, was excited because she could relate to its analogy about aircraft engines. Another missionary friend of mine, Mark Wuerffel, flew a small engine plane for Wycliffe Bible Translators in Papua New Guinea for many years. Over the years he has related many stories about the ups and downs of flying small aircraft (especially in the mountainous jungles where he had several very close calls). Now, as an instructor, he is passing on those skills and wisdom to new pilots at Wycliffe’s flight school station in Waxhaw, North Carolina. I imagine Mark could relate to Jason’s analogy too, as could my brother-in-law, who was a pilot. I believe you will too, even if, like me, you know little about airplane engines. On this Easter week, I felt this message was appropriate. “I want to encourage you with some thoughts on the GRACE OF GOD. My favorite definition for “grace” is: “God’s ability and enabling power.” We are saved by God’s grace (His ability and not our own); the only way to successfully live the Christian life is by grace (His ability and enabling power). And more specifically, for those of us in ministry, the only way to succeed in our calling is by God’s grace — His ability and His enabling power ( as opposed to self-effort).I’ve (Jason) been a pilot for many years and I’ve flown a lot of different airplanes. I’ve flown all over North America and in other countries. I’ve crossed mountains, rivers, and oceans. Through my experience, I can tell you that a piston engine airplane will get you there, but the “ride” can be slow and rough. A turboprop engine gives you more ability. And, a jet engine (completely different technology than a piston engine) is better yet! Whereas a piston engine is good to about 15,000 feet and a max of 200 mph, a jet engine will take you to 40,000 feet (above all the weather) and produce 400 mph. Wow! Over twice the ability! Paul said that he labored more than all the other apostles combined. That’s quite a statement! But notice he credits the GRACE of God (God’s ability in him). He was flying with a jet engine (grace) vs. a piston engine (self-effort). Once you “fly” with a jet engine you never want to go back to a piston engine. Why? Because a jet engine requires less effort for the pilot; you fly higher and faster; and, you enjoy the “ride” more. Do you see the analogy?Now, let me make it clear. Paul never said that it was easy — not by any means. In other places he details his struggles, his persecutions, and the dangers he faced (2 Cor. 12:7-12). In fact, Paul’s trials make the TV series “Survivor Man” look like child’s play in comparison! But, I think many of us in the ministry have missed (or forgotten) the key ingredient that Paul constantly pointed to — the grace of God (God’s ability and enabling power). It’s a wonderful day when your eyes are finally opened to the fact that “grace” is not just something to “save” you; it’s the “engine” that should be propelling you forward. Well, I told you I would keep you up to date on my knitting. We were in St. Thomas V.I. for 10 days. I took the yarn and needles along to work on a simple and adorable baby sweater for my grandson, Andy, in varigated primary-colored yarn. It is going well except that I developed bad tendonitis in my dominant elbow. The doctor and physical therapist are advising me to lay off any repetitive motion with that arm. That means no knitting or typing! I have laid down the knitting as I had to get 2 papers done and my weekly D-mail and couldn’t stop typing. I just know I am a victim of sabotage! The good news is that I read 4 books at the beach and have a nice tan. I’ll show you the sweater when it’s done enough to photograph. Last week I began a story entitled Grace, written by R.J. Conger,based on the book of Philemon. The story is what the author imagined could have been the events of the reconciliation of Philemon and his slave, Onesimus. Here is the rest of the story. “Paul of Tarsus? It is good to hear well of him. I have feared for his safety,” Philemon said, somewhat confused by this turn of events. “He is forgiven, but he has sinned against me and against God. Justice must be served.” Philemon broke the seal of the parchment and read it silently twice. Within minutes, the entire household, slaves, family, and guests alike, had gathered in the courtyard. Drafus stood at the back with his arms crossed. Philemon paced in front of the gathering. He stopped to glance again at the letter. Then he said in a loud and terrible voice, “My decree was given that any slave seeking to leave this household unlawfully shall be whipped publicly. Onesimus, having run away, deserves eight lashes across the bare of his back.” Philemon’s youngest daughter, who thought the world of Onesimus, cried out in anguish. Philemon glared at his daughter while the momentary commotion quieted. Then he said, “Because he returned voluntarily, the punishment is reduced to four lashes.” Philemon walked over to the man who held the whip and whispered in his ear. The man’s eyes grew wide. “No, sir! I can not,” he protested. Drafus ran forward. “Father, no!” The whip fell on his father’s back. “But your back, Master,” protested Onesimus, tears running down his face. And with a sudden lightning, smite the world perfect. The gospel message of our Lord Jesus Christ is based on this concept - redemption. Redemption: 1. to redeem as in to regain possession of by payment of a specified amount 2. recovery of something pawned or mortgaged. 3. payment of an obligation. 4. deliverance upon payment of ransom. 5. to save from sin and its consequences, make amends, make up for. The Bible tells us that Jesus Christ came to earth to pay the ultimate price to redeem mankind from the sin that separated us from God. He took upon himself the punishment that sin or trespass requires so that we would not have to bear that punishment. “For the wages of sin is death, but the gift of God is eternal life in Christ Jesus our Lord.” Romans 6:23. It is always hard for me to wrap my mind around that. I can understand that when a person breaks the law in our world, they must pay a price for doing so. Sometimes it is a fine but most often the punishment is a prison term. If the crime is severe, sometimes the punishment is death. In other parts of the world the punishment for a crime may be a whipping or the cutting off of a limb. It is possible, although I have never heard of it happening, that a judge would accept a substitution of another person in place of the criminal to serve the sentence. However, the law in our land and in some other countries provides for a pardon by the judge or someone given that power, such as the President or governor, should they choose to do so. In the case of debtors’ prison, the person jailed for not paying his or her debt could only be released if someone paid the amount of their debt for them. Are you beginning to see a word picture for redemption here? God cannot see or abide sin. If He could, there would be no heaven. When we sin, we are breaking God’s law which requires the payment of punishment. Because God cannot look upon sin, it means that the punishment is everlasting separation from God - which is means eternity in hell. But God has the power to pardon sin and He does so through forgiveness. However, there is still that punishment that has to be taken care of by someone. Someone must pay our debt to release us from prison. Someone must take our place as a substitute and take our punishment in order to wipe the slate clean. God sent His son, Jesus Christ, to be that someone. Jesus had to be spotless and holy as a human being in order to be our substitute. If he too were a sinner, then he would have needed a substitute too. And that substitute would have needed a substitute and so forth. Only a sinless person could be a redeemer. Why God chose to send Christ to earth at the particular point in history that He did, I’m not sure about, but because it was appointed that Jesus would bear our punishment during the Roman times, he paid the price by suffering the Roman form of supreme punishment, crucifixion. If he had been alive today, depending on where he lived, I suppose he would have been electrocuted or hanged or beheaded, etc. But the most horrible thing that Jesus suffered for our sakes was not crucifixion, as gruesome and painful as that was. It was that for the first time, Jesus, the pure, sinless Son of God, had to experience sin - and not just one sin, but every disgusting, dirty sin ever committed by men and women. And because of that, Jesus had to experience hell, the place where God turned His back on his only son. There is no way we can understand what that means, what that meant to Jesus, but it is what happened on that Good Friday 2010 years ago. Sometimes stories help us to understand a truth. Jesus was very fond of telling stories or parables to illustrate a point. Last year, my brother-in-law, R.J. Conger, who is also a writer, sent me a story he had written about the slave, Onesimus, whose story we read about in the New Testament book of Philemon. The story R.J. wrote, although it doesn’t appear verbatim in the Bible, became a very powerful picture for me of our redemption by our loving Lord Jesus Christ. I would like to share it with you in 2 parts (part 2 next week). We read in the book of Philemon that he was a Christian who lived in Colosse during the time of the apostle Paul. He was a friend of Paul’s and a member of the Colossian church. He was also a slave owner, a common practice in those times. One of his slaves, Onesimus, stole from him and ran away. Attempts to recapture Onesimus had been futile. Had Onesimus been captured, Roman law required that he would be put to death. Then Drafus turned on his heel and left for a night of reverie. A saddened Philemon went to his room to pray. “Lord, only you can reach my son.” Then Philemon’s steward came to him to tell him that the preparations were complete for the love feast that evening and also to share some troubling news. He has heard that two of Philemon’s slaves have planned to escape that night during the feast. They are modeling their escape after Onesimus, Philemon’s highly skilled artisan slave who ran away before. Philemon says that these slaves are fools, for no one will take them in as in the case of Onesimus who was hidden by those who profited from his skills because they have no skills to offer. The anger Philemon felt when Onesimus disappeared, surfaced once more. Even though he had been fond of Onesimus, he promised that should his slave return, he would be sure to have him whipped pitilously. Look for next week’s D-mail for the exciting ending to this story. If you read my story about sewing and needlework a few weeks back, you will know that when it comes to knitting, I’ve had doozies upon doozies of projects. I suppose I should have given up knitting long ago, adding it to my category of failures along with down-hill skiing, bowling, and painting. However, for some reason, I desperately want to become a knitter! So I just keep trying (and ripping out with tears). The projects are labeled “easy” and they look simple enough in the pattern photos. But do I learn? Nope. I buy the yarn and the needles and get sucked in. I’m an accomplished “cast-er on-er” now and I can do ribbing blindfolded. But somewhere along the way after that, my own personal knitting demon attacks and the project goes awry. 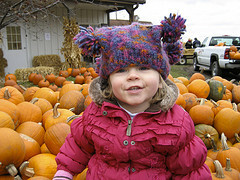 Although granddaughter Katie loves the jester hat I made her (see above photo), it turned out too big. I measured her head and knit a swatch to test the guage! Argh!! However, I wish to report that after months of knitting baby socks for my 6 month old grandson, I finished a pair that actually match and look like socks! When we were down there this past week, I presented them to his mother with great pride. I had made them long - knee socks- because he always kicks off his socks. We slid his fat little feet into them and pulled them up over his knees. They were adorable all knit in Scandanavian-like patterns. In less than 2 minutes, the little stinker had KICKED THEM OFF! Back to the drawing board. Of course by the time I figure out how to knit socks that stay on, it will be summer and he can go barefoot. Sigh. Meanwhile, I found a sweater pattern for his older sister that used bulky yarn, was knit all in one piece, and knit up so easily I was sure elves had fixed it for me while I was asleep. I was so excited when it was nearly finished as was my granddaughter. “Grandma will have your new sweater done before I go home,” I promised her with glee. The last day of the visit, I sat down to finish it. There were only 20 rows left. I ran out of yarn!!!! I’d been so careful to buy enough too. I got in the car to hit every sewing and craft store in town, determined to find one more ball of this Lion Brand boucle yarn. No dice. I spent hours online trying to find this yarn. I mean, it’s Lion Brand, not some obscure yarn! To make a long story short, I took the unfinished sweater home with me, leaving a teary granddaughter. After several days of checking - you guessed it - this beautiful, varigated Lion Brand boucle yarn is DISCONTINUED! The knitting demon strikes again. Now I either have to start over completely using a different yarn or finish this sweater with something that sort of matches and look foolish. Sigh. I refuse to go back to just knitting scarves. I have a pattern for a simple garter stitch, sleeveless summer sweater for myself and 8 skeins of the lovliest ocean turquoise shade of yarn and I’m going to get back on the horse and go for it. I’ll keep you posted. 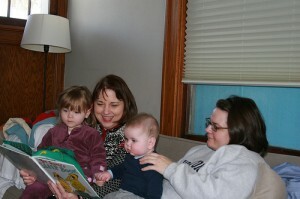 Above photo: Reading aloud to my grandchildren. This week I am sending out two weeks worth of D-mails at the same time on the same topic - partly because it is a long topic and partly because I am going on vacation until March 17th. Lately I’ve been listening to teachings on tape by Christian philosopher and physician, Dr. John Patrick. One of his topics was how a society’s hierarchy of values is passed down to the next generation through story. For example, the Jews were scattered and without a homeland for 2000 years and yet their culture remained intact. Why? Because of Deuteronomy 6. Moses taught them to teach their children not only the Law, but all the stories of how God moved among them as His chosen people. The stories were rehearsed at mealtimes, on holidays, in school, at bed time. Children had them memorized by the age of seven. They knew who they were and where their roots originated. The Judeo value system and hierarchy of virtues were thus preserved down to this day. I wonder how long our American culture would survive if we were to be dispersed around the world? What stories do our children hear repeated over and over? Sadly, TV jingles and movie lines. How does Christian culture survive and pass down its hierarchy of values and virtues? Through Bible stories. We read or tell them to our children when they’re preschoolers because that is when children love to hear stories over and over. We read them Adam and Eve, Noah and the ark, Samson, Jonah and the whale, the fall of Jericho, Moses and his deeds, Daniel and the lions den, David and Goliath, the stories of the life and death of Jesus, etc. America was founded on the virtues and values from the Bible. American children used to be taught to read from the Bible. Since that is no longer true, it is up to us as Christian parents, grandparents, and Sunday School teachers to pass on these stories in order to provide the foundation upon which our children can build the values that will guide their lives and preserve a Christian America. As Christians we need to read the Bible every day, but let’s face it, the Bible isn’t the easiest book to read. It’s language is difficult even for good readers. Imagine how challenging it is for readers who never honed their reading skills and thus hate to read. I heard on the radio today that March 3rd is National Read Aloud Day. I’d like to focus on the importance of reading to children. Illiteracy is often what condemns a person, even whole nations, to remain in ignorance. The ability to read opens the mind to knowledge beyond what a person can merely see and hear. Something this valuable must be taught from birth on up to when a child can read by himself. Even then there is value found in continuing to read aloud, for the ear catches things the eyes on a page can miss. Scientists publishing research on this topic have shown repeatedly that reading to your child from the time they can see and hear develops intelligence, longer attention spans, bonding with the written word, larger vocabularies, and so much more. My son-in-law is nearly finished with his PhD in educational psychology. In his work, he has done studies on the various ways children learn through reading and what forms of writing are best comprehended by readers of all ages. His studies have borne out what I have learned from my experience as both a child who read avidly and as a parent who read to my five children regularly. Reading begets readers! Get children excited about books by showing them how important books are to you. Time you spend curled up together enjoying a story builds loving relationships they associate with exploring books. My husband and I read to each of our children from the time they could sit up in our laps. They have all grown to be voracious readers with the intelligence and insight that comes from being well-read. Our son, Peter, practically took up residence at the public library as soon as he could read to himself. The librarians knew him by name and often set aside books for him they thought he would like. He loved reading so much that I used to find him reading the encyclopedia when he had read everything else he could get his hands on. Of course not all kids are this enthusiastic, nor do all children find the skill of reading to come as easily as Peter did, but they all miss something if they are not read to as children. Here is an interesting example. When Peter began dating a particular girl he met in college, he discovered that although she could read well enough to get through college, she didn’t like to read. Moreover, he discovered, after spending a lot of time with her, that stories he thought were universally familiar were unknown to her. Eventually, she shared with him that she had seldom been read to as a child. When she realized what a treasury of tales she had missed, she was anxious to catch up. However, she didn’t want to just get the books from the library and read them; she wanted to have the experience of being read to. So she and Pete would spend hours together reading aloud to one another. They read childhood favorites. They read the classics. They moved on to the newest bestsellers. When he brought her to our home for a weekend, they would curl up side by side on the couch or in the hammock, and share books. It was obvious how much joy they both were getting from this experience, at age twenty-one! It’s never too late to learn to love reading. Would you like your child or grandchild, neighbor or Sunday School student to be able to tackle the Bible? Teach them to love reading. Then share a children’s version of the Bible with them. Read from the Bible to your own children daily. Having trouble with the hard parts? We all do. That’s the purpose of the modern translations. The scriptures can be hard enough to read and understand without the handicap of poor reading skills. Accomplished readers can make the Bible come alive. If reading comes hard to you, practice. Practice by reading out loud to your children. Then talk about what you’ve read. Before long, they will delve into the scriptures themselves and you will have become a better reader too. The culture into which Jesus was born was an oral one. Jesus read the scriptures aloud in the synagogues where he ministered. (Luke 4: 16-20) Mary and Joseph must have seen to it that he attended Hebrew school as a child for him to be able to read like that since only the educated priests and scribes of the day knew how to read. Everyone else had to rely on that minority to teach them God’s laws and of course the stories of their heroes were passed down orally in every household. This oral tradition continued into the dark ages since there was such a scarcity of written material. One of the major reasons for the rise of the Reformation during the Dark Ages of Europe was that the Roman Catholic aristocracy had forbidden ordinary people to learn to read. Therefore, priests could interpret the scriptures to the illiterate people however they pleased, which led to confusion and corruption. Once people could read and the printing press made it possible to distribute the scriptures to the masses, the ordinary people could find out God’s truths for themselves. What’s the difference between the poor soul who had no Bible to read back then and the one today who has a pile of Bibles but won’t open one of them because he finds reading too hard and hates to read? Begin when your child is small - as young as 18 months! Let me share 20 lap-time, “read-to-me” tips that I have learned over the years. They may make it easier for you to develop this rewarding experience with your youngster. 1. Pick a routine time for reading to your child that’s best for both of you. Reading isn’t fun if you’re in a hurry, hungry, or worn out. 2. Read the books your child chooses, even if it’s the same ones over and over. 3. Read with expression and use different voices for different characters. Don’t read too fast! Let them study the pictures or grasp the details. They may see things you never noticed. 4. Ask questions about the story. Be ready to answer their questions, even if interrupted. 6. Choose well-crafted books. The children’s librarian at your local library is an excellent source of suggestions for classics and the newest award winners. Experienced parents and grandparents are good resources as well. 7. If your child loves a book, find other books by the same author. 8. Active children may listen best with paper and crayons or pencils to keep their hands busy. 9. Supply babysitters with books and make reading part of their job. 10. Don’t stop reading to your school age children. They still love the time with Mom or Dad. 11. Sometimes have older siblings read to the younger ones. 12. Don’t use lap-time reading sessions to hammer on grammar, spelling, etc. or to scold your child who is finding reading difficult. Make reading aloud fun!!! 13. Read several of your child’s favorite books onto audio tape or I-pod for them to listen to in the car or at naptime or bedtime when you are unavailable. 14. Subscribe to age-appropriate magazines for your children, such as Highlights, Ladybug, Cricket, Ranger Rick, Clubhouse Jr.,etc. I particularly like ordering children’s books from a catalog called Chinaberry Books. 15. Try writing your own books based on an experience your child has had. Let your child draw the illustrations. There are companies that take standard stories and personalize them so your child hears a story with himself as the main character! 17. Books are expensive and valuable. Teach your children to treat books carefully; no scribbling in them, no ripping pages, no tossing them on the floor, no setting wet things on them, etc. The hard back cardboard picture books are a brilliant invention for babies and pre-schoolers. 18. Once in a while take your child shopping to pick out a book that will only belong to him or her. 19. Most Christian book stores have a clerk who is knowledgeable about children’s Bibles and other Christian literature published for children. Make use of their expertise. 20. The most important thing in the first years of life is the growth of the mind and spirit. This is when a child learns to love and trust, to speak and listen. After a child turns two years old, these things are very difficult to learn or teach ever again. Trusting, singing, laughing, and language are very important in a young child’s life. Every day you put your child in your lap and read to him, as little as twenty minutes, is like putting gold coins in the bank. It will pay back valuable dividends in their attention span, their vocabulary, their love of books, their joy in learning, their imagination and their knowledge that they were loved and have had individual attention for at least twenty minutes a day.